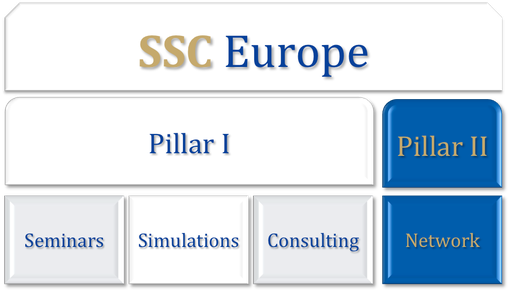 SSC Europe consists of two pillars. The three segments of seminars, simulations and consulting compose the first, and the second represents the network of experts that contribute to those segments through their individual qualifications. We are continuously enlarging our network as well as the delivered products and services. Our experts already possess a broad range of formats at hand. Don't hesitate to contact us for a customized offer for your needs. SSC Europe furthermore offers young academics the opportunity to share their ideas, experience and expertise with our network. If you are interested in participating at SSC Europe, please send us an email with your concepts and educational background or use our contact form.